This post goes to Filipinos in Saigon. Am not sure if everyone will agree but this is my local experience. In Saigon, when you get on a cab and you’ll be only traveling for a short distance, the driver is visibly irritated. In Manila, the cab driver will be ecstatic. He’d rather drive you to a short distance than drive far because of the city traffic. In Saigon, you can use your mobile phone inside the bank and use the water closet. In Manila, use of mobile phones is prohibited to prevent bank heists of course. And there are no toilets for clients. In Saigon, when the light turns green, vehicles can go straight, left or right creating a gridlock. In Manila, any major road has a number of U-turns — still causing traffic though. In Saigon, sidewalks are for people, motorbikes, and vendors. In Manila, clean as a whistle. Vendors are apprehended by the MMDA. 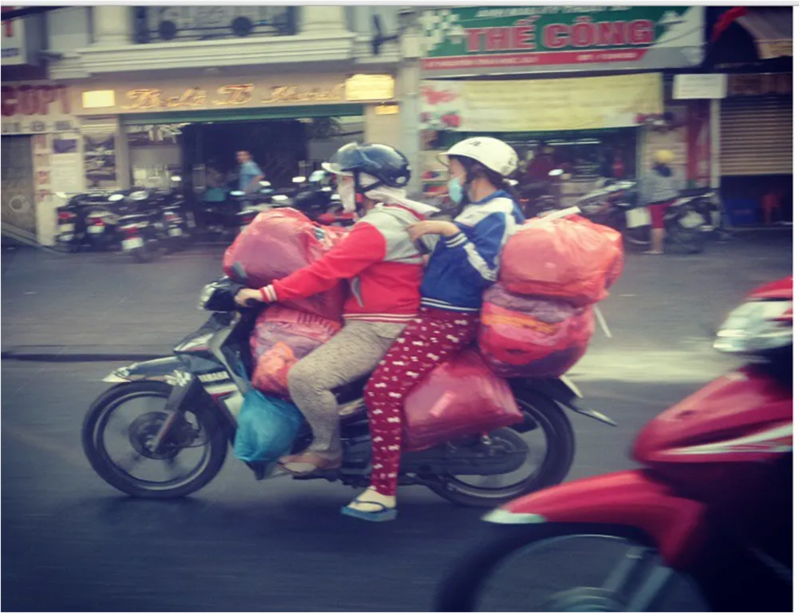 In Saigon, you can cross the street anywhere even when motorbikes are whizzing by. In Manila, if you attempt it, you’ll see a huge sign saying, “Bawal Tumawid, Nakamamatay!” (Don’t cross the street here or you’ll die!). In Manila, a maximum number of two people can ride a motorbike. In Saigon, two is the minimum. The more the many-er! Helmets and refrigerators optional. In Manila, just a sign of rain will cause people to run for cover. In Saigon? A little rain wouldn’t hurt (Keri lang!). You’ll actually feel embarrassed if you open your umbrella. In Saigon, you say “Take away” if you want to bring home food from a restaurant. In Manila, it’s “Take out” or “Take Home”. In Saigon, am sorry but I have been in several situations when locals would want to get ahead in line in a grocery. In Manila, we endure the queue. EXCEPT when getting in the train. How about you? Except for the obvious, how is your country different from Vietnam? Thanks for sharing all your experiences while living in VN.